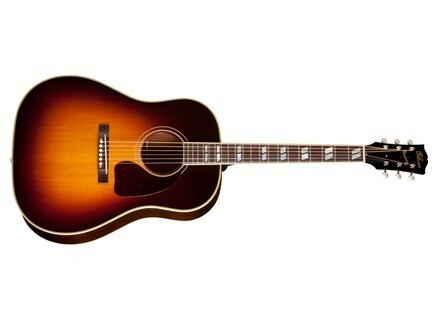 Sheryl Crow Southern Jumbo - Vintage Sunburst Model 1, Jumbo Steel String Guitar from Gibson. Gibson Acoustic and Sheryl Crow announce their second collaboration with the release of the Sheryl Crow Southern Jumbo Special Edition. This new Southern Jumbo is described as "the most advanced acoustic-electric Southern Jumbo available." In 2010, Crow modified her live acoustic guitar line-up with the same pickup system used in the Gibson Jackson Browne model released earlier that year. After a comparison of guitars and pickups, the idea for her Southern Jumbo Special Edition was born. Crow’s new Southern Jumbo is designed "for power and projection" with wider X-bracing on the red spruce top. It comes with mahogany back and sides, the combination of wood and pattern bracing being designed to give this SJ a dynamic and responsive tonal range. The acoustic-electric version of this guitar has the same stereo pickup system used in the Jackson Browne Model. Appointments include Ivroid Waverly tuners, vintage Gibson script logo and banner decal, a hand-beveled pickguard, bound fingerboard and a custom classic sunburst finish. Kemper Profiling Amplifier Review The world of amp modeling is merciless. It's been a long way since the first 6U rack processors came out with their utterly obscene prices and a sound that would make every POD Mini owner laugh out loud today. Yamaha Pacifica PAC611HFM Review Pacifica — a name that recalls the beach, the ocean, the sun. If you like sailing, following the wind for hours armed only with your courage and a fishing-rod, you'll be disappointed by the present review: this is not a hunting/fishing magazine! We review today a guitar designed by Yamaha Guitar Development Hollywood that has been on the market since 1990. It's been 22 since the first Pacifica came to the world and I look forward to discovering the features of the new generation. It's my ocean quest! Carvin JB200C Jason Becker Tribute Guitar Carvin has again teamed up with neo-classical metal guitarist and composer Jason Becker to bring the JB200C.